CBS Executive Vice President, Scott Koondel presenting the CASA Hero Award to Linda and Kate Yaccarino. Please see more pictures HERE. Left to right: Mahogany K., Naya S., Scott Koondel, Rosie W., Khadijah A.r, Shyanne H., and Nigel W.
CASA-NYC recently launched a new initiative, the Youth Leadership Council (YLC), composed of former and current foster youth. The YLC members are currently completing training in public speaking, storytelling, and professional networking in preparation for presenting to child welfare professionals and volunteers in order to impact change. On Monday, July 9th, CASA-NYC’s YLC met with Scott Koondel, CBS Executive, former foster youth and current foster care reform advocate. The meeting took place at Hogan Lovells, in the same building where Scott started his first job when he was the same age as many of our YLC members! 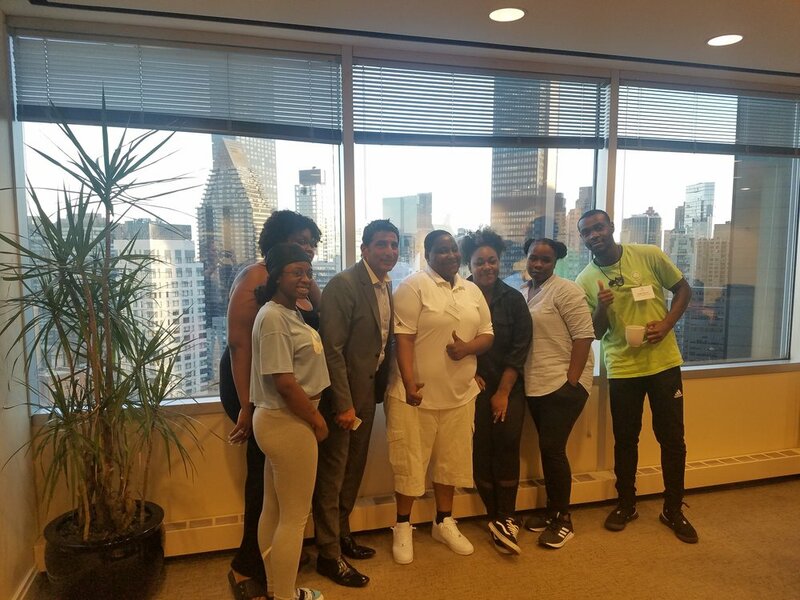 YLC members Mahogany K., Naya S., Rosie W., Khadijah A., Shyanne H., and Nigel W. were in attendance, in addition to CASA-NYC’s Executive Director, Kerry Moles and volunteer Advocate, Gretchen Holowaty. The meeting started off with Scott sharing his experiences in foster care before the YLC members joined the conversation to share their career aspirations and how advocacy can change the face of foster care in NYC. A powerful moment during the discussion was sparked by Khadijah, Mahogany, and Nigel when they asked Scott how he balanced emotions related to his traumatic past with his advocacy. This lead to a discussion on how to deal with the trauma related to being in foster care, whether one has been discharged for several years or several decades. Reliving the pain of the past in order to make an impact and potential change was an important motivator for all of the participants; through the power of sharing their stories, they hope to change the experiences of future youth in foster care. With this in mind, the conversation shifted to more hopeful endeavors, such as reinventing oneself. Scott shared that he wakes up daily with the mindset of a student; he doesn’t know everything, but by listening to others, he can learn a little more. This was a great experience and first step for the YLC members to envision their own futures and to share their visions for foster care reform. Look out for more information on the YLC in the future! As Scott said, our members “wear foster care like a badge of honor.” Their storytelling and public speaking abilities make these youth amazing advocates for sharing their own narratives to change the system! Gretchen Holowaty (volunteer extraordinaire!) and Hogan Lovells for so fervently supporting the YLC through the donation of a regular meeting room. Scott Koondel, who made time in his busy schedule to meet with the YLC members. YLC members, most of whom came to the meeting after work, still in their uniforms, and still gave great energy and life to the conversation with Scott. 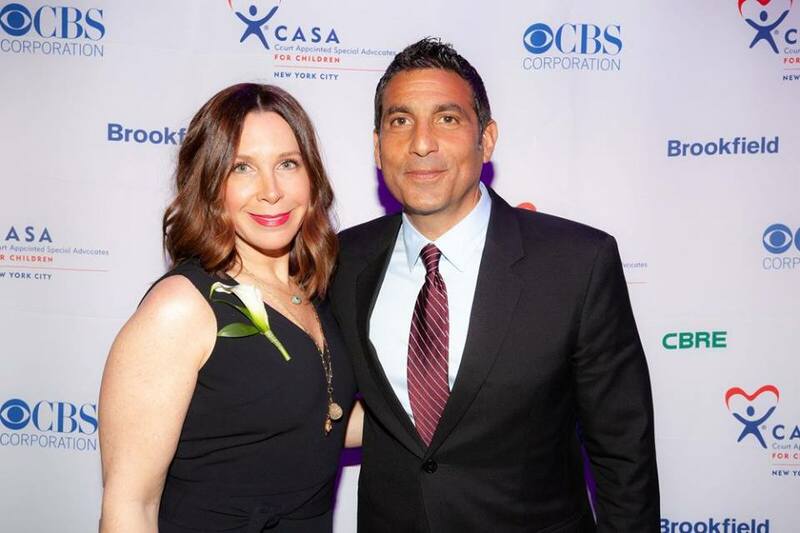 CASA-NYC's 2018 Spring Gala Honorees: long-term volunteer Advocate, Karen Azoulay and former foster youth, CBS Executive Vice President Scott Koondel. CASA-NYC's 13th annual Spring Gala, A Time for Heroes, took place on May 16, 2017 at Marquee New York. It featured a performance by comedian Monroe Martin; moving speeches by Executive Director, Kerry Moles and 2018 Spring Gala honorees, Scott Koondel and Karen Azoulay; a celebrity tribute film to the honorees; and an action-packed live auction and paddle raise. Monroe Martin, a former foster youth, kicked off the evening by regaling guests with his life experiences in foster care. His ability “to tell his story with honesty and humor is a great example of the kind of resilience we see in foster youth every day,” commented Kerry Moles. Ms. Moles talked about the impact of CASA Advocates in a city that saw a sharp increase in the number of abuse and neglect cases in family court last year. CASA-NYC has responded by doubling its efforts to provide one-on-one advocacy for foster children. Guests were treated to a short video tribute of the honorees and CASA, featuring National CASA spokespeople Dr. Phil and Robin McGraw, Academy Award winner Alison Janney and Judge Judy Sheindlin. Ms. Moles also presented the CASA Hero Award to CBS Executive Vice President and former foster youth Scott Koondel, whose resourcefulness and resiliency helped him overcome abuse and neglect while in the NYC foster care system as a child. Mr. Koondel now uses his platform in the entertainment industry to raise awareness and support for CASA and many other liked-minded organizations, in hopes that children in foster care today will get the protection and support that he did not. 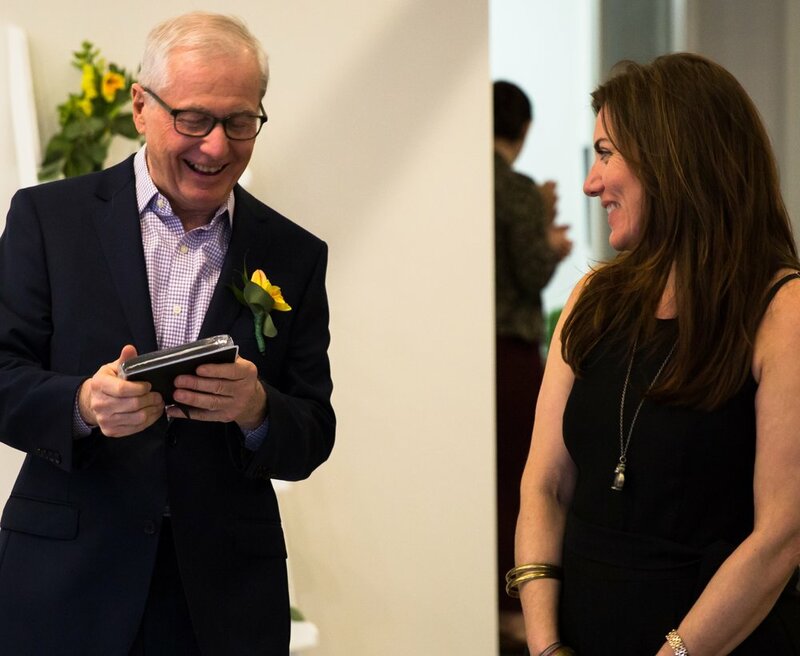 Before guests retired to conversation and to the beats of DJ Dan Guerra, auctioneer Charles Antin presented a live auction featuring several experience packages. Guests eagerly bid on an all-expense trip to Los Angeles to have a family dispute mediated by Judge Judy, exclusive tickets and access to the New York Mets, a private group dinner at Little Owl the Townhouse, a private group tasting at Moët Hennessy, and an opportunity to host a Bowlmor party for CASA-NYC’s Youth Leadership Council. The auction was followed by a live paddle raise in which dozens of generous guests participated to help us raise more than $400,000. Many thanks to our sponsors, supporters and more than 325 guests for helping to make CASA-NYC’s 2018 A Time for Heroes Spring Gala our most successful event ever! On behalf of CASA-NYC's staff, board of directors and the children we serve, thank you to all who joined us and who made this evening possible! 2018 CASA Hero Award recipient, Robert Swanton with Executive Director, Kerry Moles. Day after day, CASA-NYC serves children and youth in foster care due in large part to the efforts and labors of our team of volunteer Advocates and with the help of our small staff of social workers. These civic-minded individuals donate more than 26,000 hours to serve more than 1,000 children every year! Our Advocates spend their days researching much needed resources, collaborating with case workers and attorneys, updating family court judges, and so much more, all in an effort to help foster children move to safe, loving, and permanent homes and youth aging out of foster care prepare for independent living. Volunteer appreciation is every day at CASA-NYC but once a year we gather to celebrate the invaluable service our volunteer Advocates provide to those in need. On Wednesday, April 11th CASA-NYC held its annual Advocate Appreciation Evening at a trendy loft in Tribeca, NYC. Organized by our Volunteer Coordinator, Lizaura German, the evening recognized the 146 volunteer Advocates who donate their time to upholding CASA-NYC’s mission. We honored CASA Hero Award recipient, Robert “Bob” Swanton for his 18 years of dedicated service to foster children and youth. We consider every volunteer Advocate a champion in the foster care arena, without whom children and youth might fall through the cracks of the system. CASA-NYC staff and Board thank our Advocates for so passionately helping foster a hope for a better future! A special thanks to Karen Azoulay for her support and direction in planning this year’s Advocate Appreciation Evening. 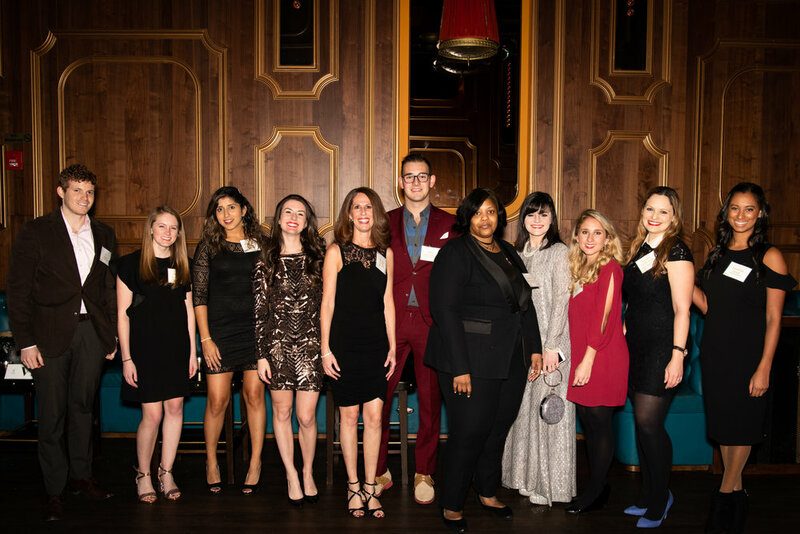 CASA-NYC's 12th annual Fall Gala, hosted by CASA-NYC’s Associate Board, took place on November 2, 2017. Our MC for the evening was comedian Dan Nanian, best known for his clean comedy. Dan has performed for numerous of politicians and celebrities including Barack Obama. CASA’s Associate Board honored advocate extraordinaire, Marissa Soroudi. The evening also featured a live DJ set, and a silent auction which offered exclusive experiences and luxury items. Thanks to our sponsors, supporters and more than 150 guests, who made this event such a success! More than $35,000 was raised to support CASA's work with children and youth in foster care. We are grateful to the sponsors of CASA's 2017 Fall Gala, including, Bloomberg Philanthropies, Center View Partners, Duane Morris, and Paul Yi. On behalf of CASA-NYC's staff, Associate Board members, and the children we serve, thank you to all who joined us and who made this evening possible! Our emcee for the afternoon was Charell Star, CASA Board Member and former foster youth. Dr. Kathryn Conroy was presented with the first CASA Heroes Award for her extraordinary leadership in the field of child welfare over the past 50 years. Dr. Conroy has been on the board of CASA-NYC for two decades. The award was presented by CASA Board Chair Jessica Aaron who shared anecdotes about Dr. Conroy’s mentorship and impact on generations of social workers and advocates for women and children. Khadijah Alexander, college student and former foster youth, and Barbara Edwards Deslman, volunteer Advocate, spoke about their work together as Barbara supported Khadijah’s transition from foster care to life as a college student living on her own. Executive Director Kerry Moles made remarks about CASA’s role in New York City’s child welfare system. Jessica Aaron, Heather Benn, Odile Buclez-Birsh, Laura Busker, Leah Coakley, Kathryn Conroy, Barbara Delsman, Kendreia Elvis Heick, Carolyn Gershenson, Merritt Greene, Stephanie Madden, Hedy Matteson, Jami Mills Vibbert, Frances Reilly, Julie Safer, Joanne Seelaus, Bree Sheahan, Charell Star, and Abigail Weinshank. On behalf of CASA-NYC's staff, board of directors, and the children we serve, thank you to all who joined us and made our first annual luncheon a tremendous success! CASA-NYC's 12th annual Spring Gala, A Time for Heroes, took place on May 3, 2017 at Marquee New York. Our wonderful MC for the evening was NBC News Anchor David Ushery. Executive Director Kerry Moles spoke about the impact of CASA volunteers and introduced honoree Amity Boye. Ms. Boye is an attorney with the law firm White & Case who has served as a volunteer Court Appointed Special Advocate for more than 18 years. She has had a tremendous positive impact on dozens of children in foster care and youth transitioning to independent living. The event program also featured a live auction in which several experience packages, including tickets to sporting events, live show tapings, and exclusive dining opportunities, were auctioned to raise vital funds for the organization. A paddle raise in support of CASA’s programs concluded the event program. Thanks to our sponsors, supporters and more than 300 guests, this was our most successful fundraising event yet! In total more than $350,000 was raised to support CASA's programming. This amounts to more than a quarter of our annual budget. CASA-NYC's annual 11th Fall Gala, hosted by CASA-NYC’s Junior Board, took place on October 5, 2016 at Hudson Terrace. Our MC for the evening was comedian and former foster youth Martin Monroe III. He spoke about his experiences in the foster care system, and the important role that Court Appointed Special Advocates play in supporting youth in foster care. The evening also featured a live DJ set, and a silent auction which offered exclusive experiences packages and luxury items. Thanks to our sponsors, supporters and more than 150 guests, who made this event such a success! In total more than $40,000 was raised to support CASA's programming. On behalf of CASA-NYC's staff, Junior Board members, and the children we serve, thank you to all who joined us and who made this evening possible! CASA-NYC's 11th annual Spring Gala, CASA HAUS Party, took place on May 11, 2016 at HAUS Nightclub. Our wonderful MC for the evening was Talk Stoop host Cat Greenleaf. She moderated a panel discussion between Board President Kathryn Conroy, former foster youth and CASA-NYC Junior Board member Daniel Gura, and Board member and CASA Advocate Ailsa Fox, who spoke about the impact of CASA advocacy on the lives of children and youth in foster care. The event program also featured with a live auction in which several experience packages, including tickets to sporting events, live show tapings, and exclusive travel opportunities, were auctioned to raise vital funds for the organization. A paddle raise in support of CASA’s programs concluded the event program. Thanks to our sponsors, supporters and more than 200 guests, who made this event such a success! In total more than $250,000 was raised to support CASA's programming. On behalf of CASA-NYC's staff, board of directors, and the children we serve, thank you to all who joined us and who made this evening possible! 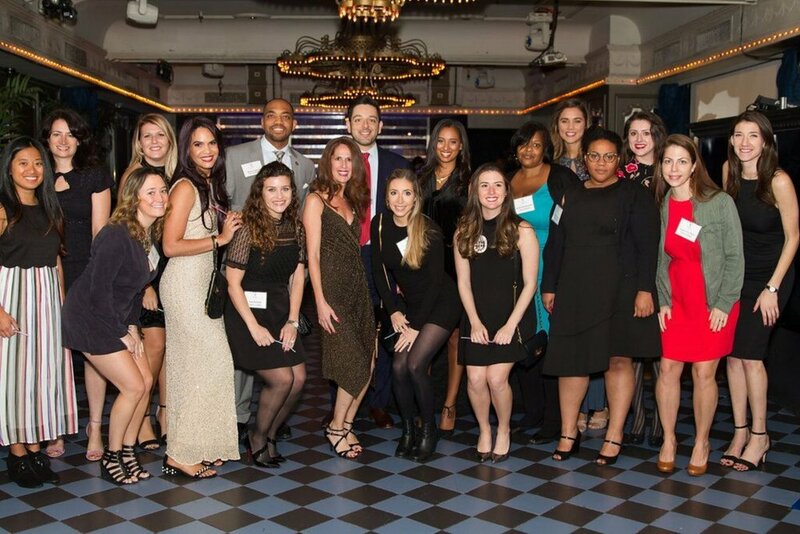 CASA-NYC's annual 10th Fall Gala, hosted by CASA-NYC’s Junior Board, took place on October 1, 2015 at Up and Down Nightclub. Daniel Gura, Junior Board member and former youth in foster care delivered the keynote address. He spoke about the important advocacy that Court Appointed Special Advocates lead in service of improving the lives of children and youth navigating the foster care system. The evening also featured a live set by DJ Kyle Powers, and a silent auction which offered exclusive experiences packages and luxury items. CASA-NYC's 10th annual Spring Gala, Speak Up for a Child, took place on June 2, 2015 at Hudson Terrace. Our MC for the evening was Talk Stoop host Cat Greenleaf. CASA Volunteer Kristian Satter was honored for her dedication and commitment to the organization’s mission, and her many years of service as a Court Appointed Special Advocate. Thanks to our sponsors, supporters and guests, who made this event such a success!